Media: Soft cover, A4, 41 pages of text, approximately 170 B&W and 34 colour photos, 13 colour profiles and fold-out sheet of 1/72 scale planes. Advantages: Extensive collection of photographs, 1/72 scale plans. We first need to dispense with two possible misconceptions about the monograph under review and the various designations of the Il-2 “Shturmovik” (“Attacker”). First, one must pay attention to the subtitle in smaller print. This monograph is not about all the variants of the Shturmovik. 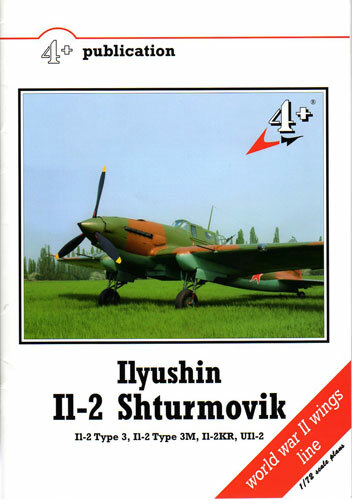 Rather, it is limited to the incarnations of the two-seat, swept-back metal wing Il-2 Shturmovik, as listed by the authors: Il-2 Type 3, Il-2 Type 3M, Il-2KR and UTl-2. Second, according to a number of writers on VVS aircraft, there was no other designation for any variation, type or sub-type of the Shturmovik other than Il-2, (except for the torpedo version which was the Il-2T). The various designations described in the monograph are merely creations of Western and, in some instances, East European writers. If there was a specific designation of a particular type of model, it was based on the type of motor. So, since all the Il-2 types and sub-types, which are the subject of this monograph, had the Mikulin AM-38F engine, they would all simply be designated as Il-2 AM-38F Shturmoviks. The author’s begin their monograph with an all too brief account of the development of the IL-2 and each of the type / subtypes covered. They also give a sentence or three to the Il-2 as employed by the Yugoslavs, Bulgarians, Poles and Czechs. The monograph continues with a technical description of the various aspects of the IL-2 AM-38F. The specific paragraphs cover the fuselage, tail unit, wings, undercarriage, power plant, electrical system and flight controls. All this is covered in three double columned pages. Finally, the text concludes with a description of the armament and equipment carried by the IL-2 AM-38F. This includes a chart of the external stores and drawings of various rockets, bombs and machine guns. There is no discussion of the combat history or use of the Shturmovik. The bulk of this monograph is made up of pictures. The bulk of the pictures is made up of photographs, both colour and black and white, of the recently restored Il-2. This aircraft was restored in 2005- 2006 and is presently on display at the Aviation Museum of the Czech Republic at Prague-Kbely. Basically, all the colour pictures are of the restored Il-2. Between the color and black and white picture of the restored aircraft, the monograph provides a walk-around of the Il-2. There is a set of 1/72 scale drawings of the Il-2 on a two-sided fold-out. Not only are topside and bottom views drawn, but also drawings of specific details. Although nicely rendered, I cannot comment on their accuracy. Finally there are the profiles, a few of which may interest modelers in doing post-war Yugoslav or Czech schemes. There is even an Il-2 in RAF markings, done by the Czechs for a movie. It is a shame that we do not have a definitive work on the Il-2 Shturmovik like that which was done on the Henschel Hs 129. Be that as it may, this is a good addition to the little bit we do have, in English, on this most interesting aircraft. It can be considered as an addition and supplement to the older “In Action” volume on the Il-2, as it does update our knowledge of the camouflage scheme employed and provides scale drawings. Thanks to 4+ Publications for the review sample.